Nee's giveaway! For all HK fans! - Cherry Colors - Cosmetics Heaven! Nee's giveaway! For all HK fans! *answer her question on her blog (and probably yours too!) 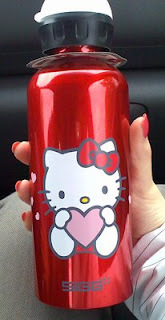 : what is your favorite hello kitty item that you own? So my fav HK item is: (some of you may remember this!) My SIGG water bottle in alu! It's eco and so pretty! I carry it with me all the time, and people notice it too xD! Go check out the lovely Nee!